On a frigid morning, a group of Red Cross volunteers mill about the parking lot of Aqueduct Race Track for just a short time before snapping into action under the direction of Red Cross volunteer, Nelson Valina, an active duty Colonel in the United States Marine Corps. The food has arrived at Kitchen 2 and there is now much to be done. Like an efficient platoon of Marines, the volunteers take their place at the truck to quickly unload the day’s meals for those affected by Hurricane Sandy. They hurriedly take cambros of hot food and are then directed to the correct pallet by Col. Valina. A makeshift cardboard chart shows where each pallet is located, making the unloading that much faster and more efficient. In a matter of minutes, the truck is unloaded, the pallets are filled with hot food and fresh fruit and the next phase of the mission begins. During the brief down time when the Emergency Response Vehicle (ERV) drivers race off to get their vehicles, Col. Valina transforms from commanding officer to cheerleader. “You guys rock! You guys rock!” he shouts to the volunteers in the freezing temperatures. Everyone smiles, high-fives all around, the morale couldn’t be higher. Time to switch gears again, there is still work to be done and the Colonel doesn’t easily forget that we’re here to do a job, we’re here to take care of people and fulfill the Red Cross mission. Now that the pallets are loaded, it’s time to load the ERVs heading out to the neighborhoods. Each ERV is directed into the yard with precision, stopping near its assigned pallet. Again, the platoon of volunteers snaps into action – grabbing cambros and cartons of fruit from assigned pallets and loading them into the back of the ERV. Loaded with food and other supplies, the ERVs then depart for their assigned routes. 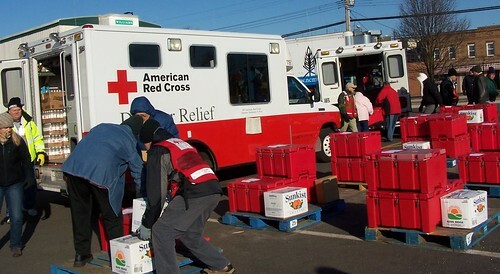 Each ERV heads to a different neighborhood affected by Sandy. Col. Valina even has his route once the yard has been cleared and all ERVs are ready to head out. Some drivers remain for weeks, getting to know those residents on their assigned route. Others switch routes and see different parts of the New York community. No matter, the result is the same…fulfilling the Red Cross mission by bringing comfort to those affected by natural disaster. A hot meal, a listening ear, a caring smile or just a hug; those are the items provided for relief. Those, and the amazing volunteers, are what make the American Red Cross tick. This entry was posted on Wednesday, January 30th, 2013 at 2:03 PM and is filed under Hurricane Sandy, Stories. You can follow any responses to this entry through the RSS 2.0 feed. Responses are currently closed, but you can trackback from your own site.